About two dozen protestors stand outside of Douglas County School District's administrative building in Castle Rock prior to a Feb. 5 school board meeting. The group voiced concerns over the school board's handling of a teacher at the center of controversy and district policy on public comment. Following weeks of skepticism from many parents and taxpayers, Douglas County Superintendent Thomas Tucker recommended the school board fire a middle school teacher whose controversial Twitter posts went viral. The student Grissom mentioned by name, however, was not actually at the rally. Tucker formally recommended Grissom's termination at a Feb. 5 school board meeting. Under Colorado law, Grissom may request a hearing on the basis of her termination before a hearing officer, who would make a recommendation to the school board, according to a statement from Tucker. While the dismissal process is ongoing, Tucker said, the school district will not provide further comment. In the meantime, Grissom will remain on paid leave. The district's handling of the process has outraged many community members. 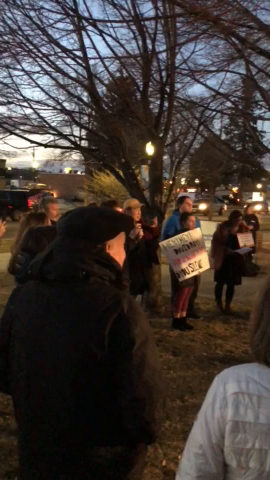 Before the Feb. 5 board meeting, outside of the district's administrative building in Castle Rock, nearly two-dozen protesters stood on the grass, in the bitter cold, holding signs and chanting in opposition of the school board. At the previous school board meeting, deputies from Douglas County Sheriff's Office escorted a man from the building for addressing Grissom by name. The school board claimed the man violated district policy, prohibiting individuals from using specific district employee names during public comment. The policy is in place to protect the district from possible litigation for defamation or slander, according to school board and cabinet members. Grissom's tweet referenced videos from a D.C. rally that show a group of students — many wearing red, "Make America Great Again" hats — from Covington Catholic High School in Park Hills, Kentucky, hollering and cheering school chants while an Indigenous Peoples March took place. One of the students drew national attention by standing face-to-face with a Native American, who was playing a drum during the march. Grissom — whose Twitter account has since been deleted — also served on the local teachers' union. Kallie Leyba, president of Douglas County Federation, confirmed that Grissom resigned from her position on the union's executive board the morning of Jan. 23. On Jan. 25, Grissom emailed an apology to the family of the boy she mentioned in the tweet, a statement she also sent to media outlets. In her statement, Grissom expressed remorse for her actions and for not making a public apology sooner. At the Feb. 5 board meeting, following requests from several parents during public comment, school board President David Ray said the board would review district policy on public comment and social media use.